The payments segment in Africa continues to heat up pitting giants Visa and Mastercard. The two firms face stiff competition with the proliferation of mobile money services in Sub-Saharan Africa. In this light, Visa signed a deal with Airtel, which allowed for the integration of the Airtel Money service with an Airtel Visa card. The Visa card was launched in all markets where Airtel serves. MasterCard on the other hand has concentrated on banks. 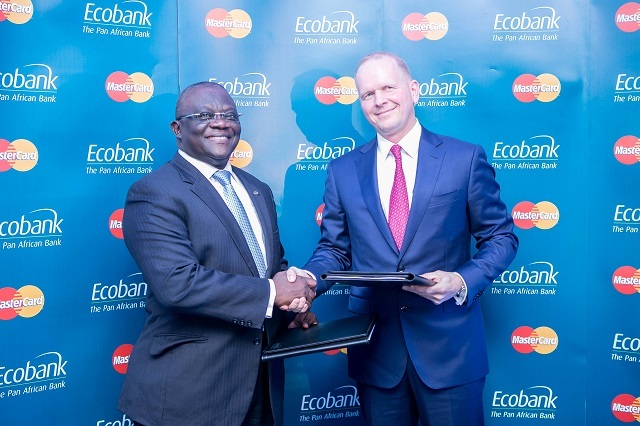 Mastercard has now signed a deal with Ecobank, aimed at providing MasterCard’s payment solutions to more than 32 sub-Saharan African markets, in which Ecobank has a presence. Ecobank will issue its customers with MasterCard debit, prepaid, and credit cards over the next 10 years. The agreement will enable the bank’s customers to make transactions in over 210 countries where MasterCard is supported. As per the deal, Ecobank will roll out MasterCard acceptance solutions aimed increasing merchant locations accepting MasterCard payments. This will involve issuing mobile point of sale devices to retailers in selected markets. The Mobile point of sale devices will allow merchants to process MasterCard payments card transactions by connecting their smartphone or tablets to a secure card reader. Ecobank will also introduce the Mastercard Payment Gateway service in various markets aimed at enhancing online commerce for the bank’s small and medium enterprise, commercial and corporate customers. The gateway also adds an additional layer of online shopping security to cardholders through the implementation of 3D secure technology. The deal will allow MasterCard to compete directly with Visa. MasterCard has been gaining traction in the Kenya market having signed on board Equity Bank. There is also information of a possible deal between MasterCard, KCB and Safaricom for the launch of a prepaid debit card.